She was found laying by the road in Seagoville Texas . Whoever dumped her there left her with a pillow, blanket and a small amount of dog food. A kind woman driving by saw her and immediately reached out for help. Seagoville Animal Control picked her up and we raced her to the Vet quickly as we could. 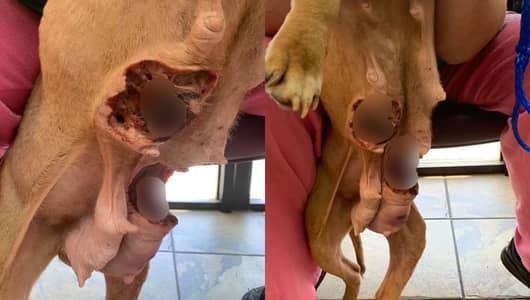 These gaping wounds in her belly are from severe mastitis resulting in infected mammary glands that ruptured from the infection that raged through her little body. 0 Response to "Becca has been used as a breeding machine her entire life"